Figure 1. 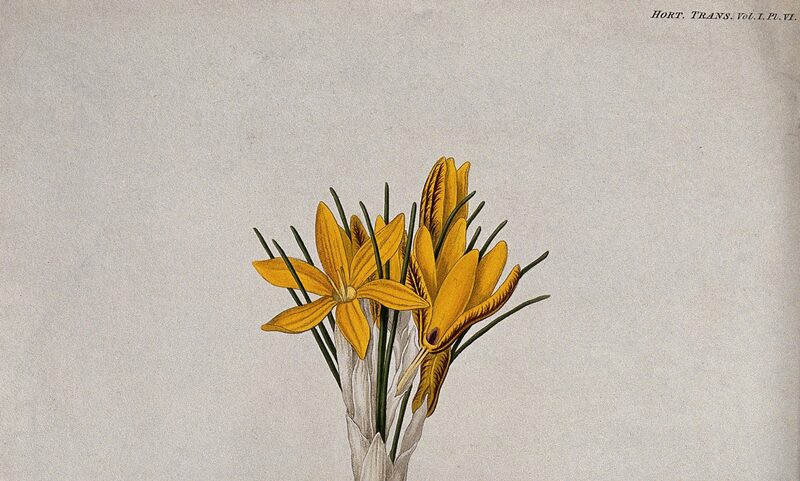 Image and caption from Congress of the US, Office of Technology Assessment, Impacts of Applied Genetics: Micro-Organisms, Plants, Animals (Washington, DC: US Government Printing Office), 5. Public Domain. Figure 2. 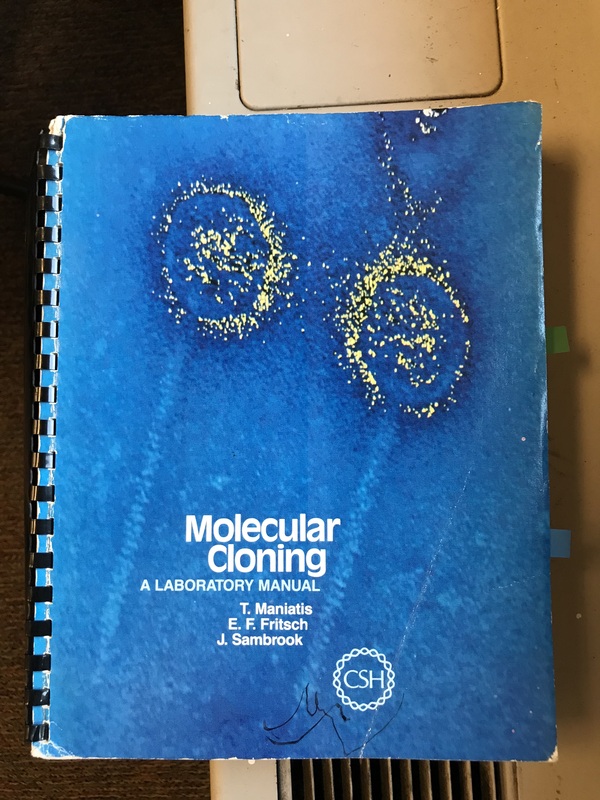 Cover of Tom Maniatis, Ed Fritsch, and Joe Sambrook, Molecular Cloning: A Laboratory Manual (Cold Spring Harbor, NY: Cold Spring Harbor Laboratory Press, 1982). Author photo. The three authors explain in the Preface that because “the manual was originally written to serve as a guide to those who had little experience in molecular cloning, it contains much basic material.” Indeed, the book was full of both recipes and tips. That said, part of its success, according to one early user, was that it communicated enough about the science behind the recipes that users were able to trouble-shoot the problems they ran into. And part of the utility of the book was that, by virtue of its plastic-ring binding, it could be laid flat on a laboratory bench  (Figure 3). Figure 3. Pages 92 and 93 of Maniatis, Fritsch, and Sambrook, Molecular Cloning: A Laboratory Manual. One can see how the book is spiral bound so it lays flat when open. Author photo. Figure 4. 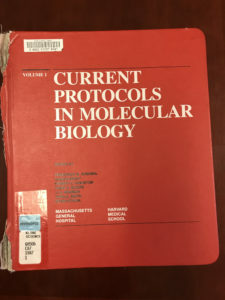 Frederick M. Ausubel, Roger Brent, Robert E. Kingston, David D. Moore, J. G. Seidman, John A. Smith, and Kevin Struhl, eds., Current Protocols in Molecular Biology, vol. 1 (New York: John Wiley & Sons, 1987). Author photo. Figure 5. 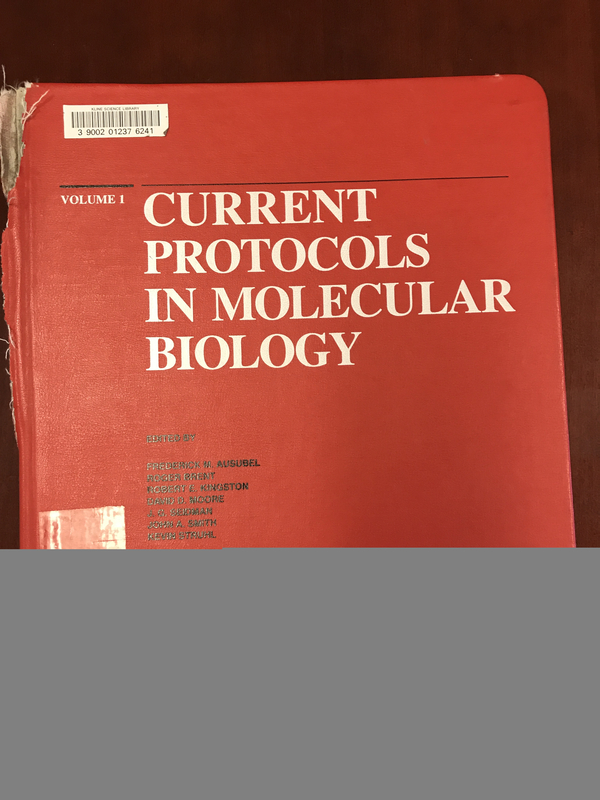 Ausubel et al., eds., Current Protocols in Molecular Biology, open so that dividers between the sections of the loose-leaf bound book are visible. Author photo. Figure 6. 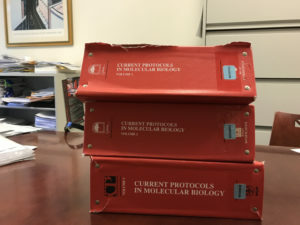 Three of the first five volumes, published in the late 1980s, of Ausubel et al., eds., Current Protocols in Molecular Biology, stacked on office table. Author photo. For an overview see William Hayes, The Genetics of Bacteria and their Viruses (New York: John Wiley & Sons, 1965). S. M. Tilghman, D. C. Tiermeier, F. Polsky, M. H. Edgell, J. G. Seidman, A. Leder, L. W. Enquist, B. Norman, and P. Leder, “Cloning Specific Segments of the Mammalian Genome: Bacteriophage Lambda Containing Mouse Globin and Surrounding Gene Sequences,” Proceedings of the National Academy of Sciences, USA 74 (1977): 4406–4410; D. C. Tiermeier, S. M. Tilghman, and P. Leder, “Purification and Cloning of a Mouse Ribosomal Gene Fragment in Coliphage Lambda,” Gene 2 (1977): 173–191. 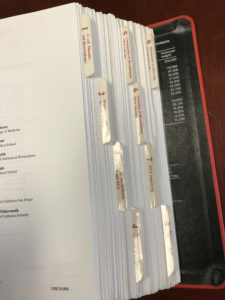 Richard M. Lawn, Edward F. Fritsch, Richard C. Parker, Geoffrey Blake, and Tom Maniatis, “The Isolation and Characterization of Linked d- and b-Globin Genes from a Cloned Library of Human DNA,” Cell 15 (1978): 1157–1174. Interview with Tom Maniatis, Columbia University, New York, Tuesday, Oct. 25, 2016. Jonathan Karn, “Yet Another Maniatis?” Trends in Genetics 4/9 (Sept 1988): 268. He was chair of an NIH study section and running a big lab, which involved constantly writing grants, as well as teaching a full load at Caltech. Interview with Maniatis, op. cit. Joe Sambrook was a talented and combative British tumor virologist whom Maniatis met when doing his cloning work at CSHL in the 1970s. Involving him as an author of the molecular cloning manual enabled a certain redress at CSHL. A few years earlier Sambrook had contributed significantly to John Tooze’s Tumor Virology book, but this was not acknowledged by his being an author. Personal communication, Alex Gann, 26 May 2010. Interview with Maniatis, op. cit. Tom Maniatis, Ed Fritsch, and Joe Sambrook, Molecular Cloning: A Laboratory Manual (Cold Spring Harbor, NY: Cold Spring Harbor Laboratory Press, 1982), iii. Conversation with Michael S. Levine, fall 2016. Stephanie Radner, Yong Li, Mary Manglapus, and William J. Brunken, “Joy of Cloning: Updated Recipes,” Trends in Neuroscience 25/11 (Nov 2002): 594–595. Memorandum from Susan Gensel to Jim Watson, 10 Dec 1982, re: sales at the American Society for Cell Biology meeting, Watson papers, Cold Spring Harbor Laboratory Archives. At that meeting Molecular Cloning sold 83 copies, and all the other sales together, 22 titles in all, made up 102 copies. 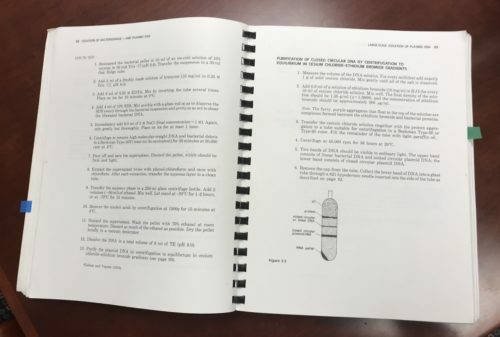 British Society for Developmental Biology Newsletter VII, October 1982, review of Molecular Cloning: A Laboratory Manual, copy in Cold Spring Harbor Laboratory Archives. Cold Spring Harbor Laboratory Annual Report 1982, 12. J. Sambrook, E. F. Fritsch, and T. Maniatis, Molecular Cloning: A Laboratory Manual, 2nd ed. 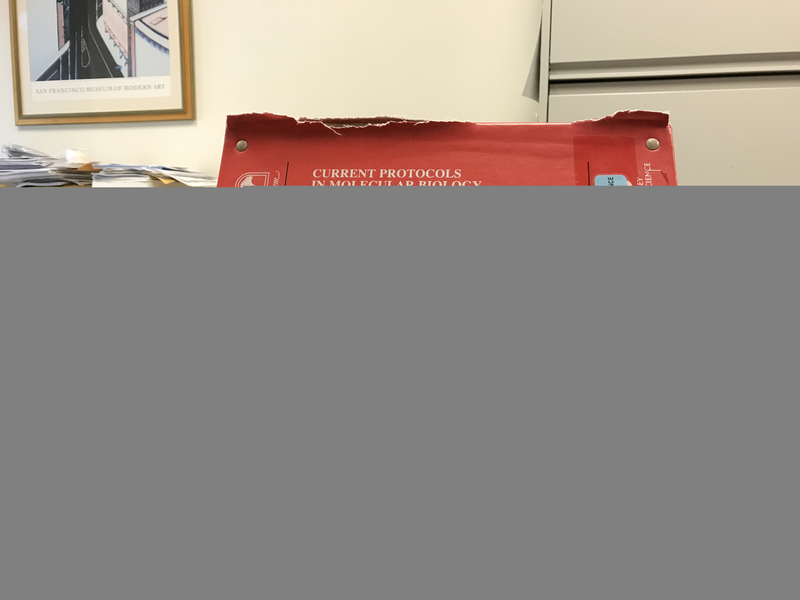 (Cold Spring Harbor, NY: Cold Spring Harbor Laboratory Press, 1989). This edition was three volumes. Stuart Orkin, “By the Book,” Nature 343 (15 Feb 1990): 604–605, on 604. S. J. W. Busby, “Comprehensive Cloning,” Trends in Genetics 4/12 (Dec 1988): 352. 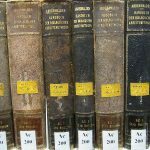 The Harvard-affiliated editors were Frederick Ausabel, Robert Kingston, Jonathan Seidman, and Kevin Struhl.